We may live in a city but we can't escape the impact of natural systems - weather particularly. And January has proved, in case any of us had forgotten, that snow has a huge impact on our ability to operate and get around as a city. The bike lanes post-snowstorm can be a mess as snow and ice melted. We wanted to share what we learned about the current policies from DDOT at the latest BAC meeting. Snow removal is the responsibility of a the Snow Removal Team, comprised jointly of the Department of Transportation (DDOT) and Department of Public Works (DPW). They are responsible for road and bridge snow removal, including Key, Memorial and Teddy Roosevelt bridges. During moderate storms like on January 6th, the bike lanes are plowed when the snow removal crews are doing their second round plowing and going curb to curb. The first round plowing tends to shove snow in the bike lanes, hence their clearing on the second pass. In larger snow events, light plows are deployed during the first pass to clear the lanes. Tool Cat. Photo from @bikepedantic. 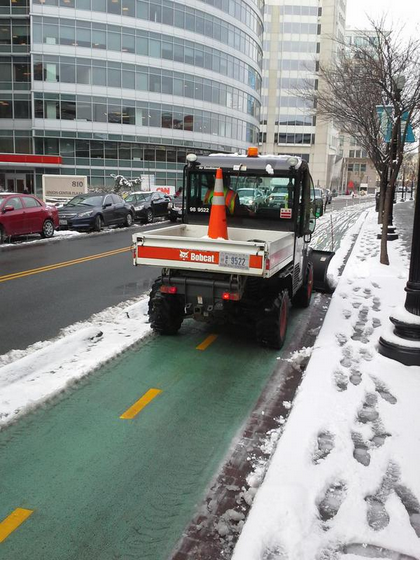 Cycletracks are too narrow for the mainline plows and require a specialized plow - newly purchased by DDOT. The Toolcat is 5 feet wide and bought solely for clearing the protected lanes (which does mean that it is too wide for clearing bridge sidewalks). The bike team of DDOT are the ones trained to use it, so next time they are out, wave hi to Mike/Darren/Jim! It takes about 6 hours to plow the loop of the 15th St NW, L St NW, M St NW, 1st St NE, Pennsylvania Ave and the Metropolitan Branch Trail. This is the first year with the Toolcat, so DDOT is both testing whether the truck is the right tool for the job and how snow removal should inform future planning, design and maintenance of cycletracks. As many folks noticed, the MBT was plowed except for the M St NE ramp. DDOT let us know that the plow blade was slightly too wide for the Tool Cat to go up it, despite the million point turn attempted by staff. A new narrower blade will be purchased. The BAC would like to remind everyone to report currently needed ice and snow removal (and other maintenance requests) to 311, and let the snow removal team know what areas could use improvement for next time round at dpw@dc.gov.